Illustration used with permission of the SCF Committee. Our World 2.0 attended the Yokohama Renewable Energy Exhibition recently to see how Japanese technology in the sector is progressing. We wanted to find out what is new in the areas of wind, solar and biomass and how quickly new technologies are likely be adopted in the marketplace. At the end of 2009, the worldwide capacity of wind power generators stood at 159.2 gigawatts, generating 340 TWh per annum (equivalent to about 2 percent of worldwide electricity usage), according the World Wind Energy Association’s annual report. Much of the potential increase in renewable energy around the world can come from wind but significant investments will need to be made, including in offshore wind farms. To cope with various social, meteorological and topographical situations, wind technology has developed much over the years. Notable steps are the growth in the size of rotors, allowing a higher volume of electricity to be generated; the installation of variable-speed turbines with rotors capable of handling increases and decreases in wind speed, thus mitigating power fluctuation and noise pollution; and construction of offshore floating turbines to harness consistent and strong winds, some of which are now, at pilot stage, capable of producing 5.0 megawatts of electricity. 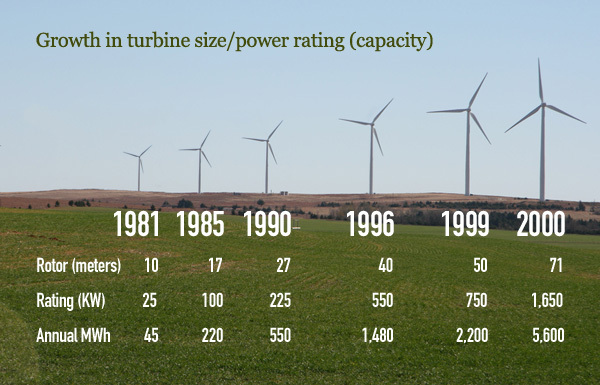 Source: American Wind Energy Association. Photo by Travel Aficionado. At the Yokohama Exhibition, one of the most noteworthy advances in wind technology, the wind lens, has already seen the light of day. The name derives from the lens of a magnifying glass because, in the same way that a magnifying glass can intensify light from the sun, wind lenses concentrate the flow of wind. The structure of the wind lens is relatively simple; a large hoop, called a brimmed diffuser, intensifies wind blows to rotate the turbine located in the centre. Wind lenses, given their efficiency, can miniaturize the size of wind turbines and hence reduce construction costs. They can also help improve safety, reduce noise pollution and therefore make the technology more accessible in urban environments. Though wind lenses presently cost more to manufacture, due to the materials needed for the additive loop, Professor Ohya says “the merit of two- or three-fold increase in power output leads to higher cost performance.” Further, he is confident that the cost performance will continue to improve. Despite its merits, even if this technology does enter the market in Japan, it may not be easily adopted by other countries, due to differing intensities and directions of wind conditions (e.g., in Japan, coastal winds tend to be quite weak most of the year). 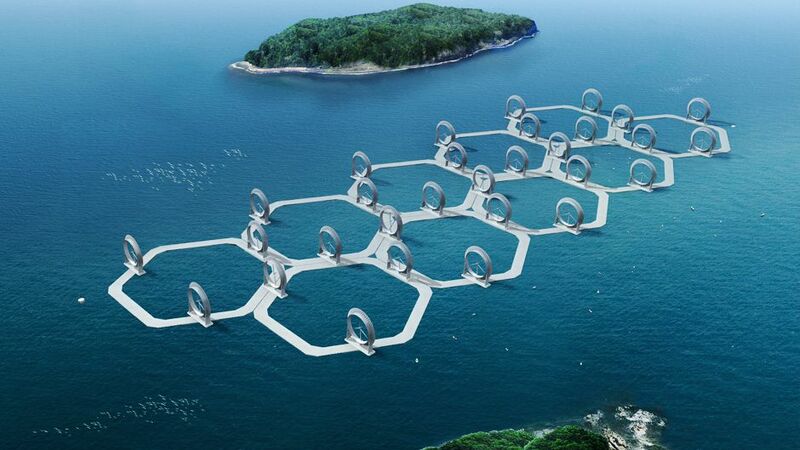 However, depending on developments in the architecture and design of offshore wind farms, and in combination with the geographical conditions of the Japanese coastline, an increase in energy absorption could be had. 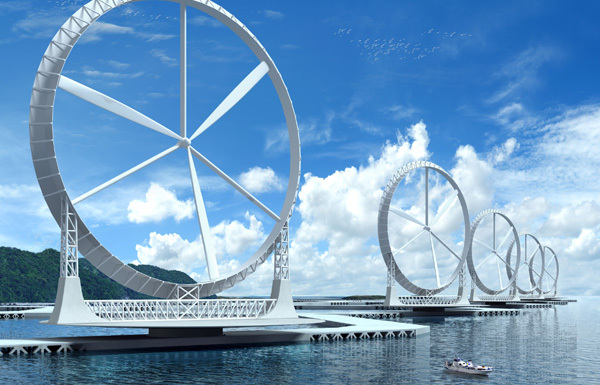 Prof. Ohya says he expects that if large offshore floating wind farms are realized (see illustration) wind energy will go mainstream. In Europe, for example, the European Wind Energy Association believes that it would take €2.4 billion (US $3.3 billion) invested in ships in order to provide for the predicted growth of offshore wind farms. “As you know, wind turbines and solar plants need a wide area to produce big electricity,” Ohya says. However, he points out that though Japan is a narrow land, it ranks amongst the countries of the world with the largest offshore maritime boundary areas (or Exclusive Economic Zones). Meanwhile, engineers from Osaka Prefecture University’s Department of Applied Chemistry are designing and developing new sensitizers that allow solar cells to absorb a wider range of wavelengths of light. According to the inventors, this technology can increase the efficiency of current solar cells by at least 15 percent. The Yokohama fair exhibited many examples of photo-voltaic technology, including a ‘smart house’ in which household essentials — such as kitchen appliances, water heaters, air conditioners and even cars — are powered by solar electricity. The potential CO2 reductions from smart homes that incorporate energy management systems are about 56 percent. Having an all-electric home that incorporates energy efficient appliances that are controlled via a computerized energy management system can reduce a significant amount of household CO2 emissions, and of course even more so if the power comes from home-generated renewable energy sources such as solar panels, heat pumps and home wind turbines. According to Tokyo Electric Power Company, the potential CO2 reductions from smart homes that incorporate energy management systems are about 56 percent. At the fair we found an example of such systems in Panasonic’s Lifinity, which allows family members to display their electricity production and consumption ratios in order to adjust their energy use. This may sound clichéd but measurement of our domestic energy impact is critical — you cannot manage what you cannot measure. If we can visualize on a daily basis how much our energy is costing us and where we are being wasteful, we can more likely change our energy use habits, appliance by appliance. If the Yokohama exhibition is any indication, the generation of biofuels is one of the main areas of research for many Japanese institutes. The Central Research Institute of Electric Power Industry (CRIEPI) presented interesting research on generating “green crude oil” from blue-green microalgae (bacteria that obtain their energy through photosynthesis). CRIEPI has simplified the complex process used in existing algae technologies by applying a particular dewatering substance to extract organic compounds (the oily components) from high water-content microalgae. The benefit of this process is that it avoids dehydration of the biomass, extraction of crops and the use of toxic organic solvents, so another advantage of the distillation process is that it has no adverse effects on the environment or the ozone layer. This new manner of obtaining green crude from microalgae could be part of a mix of sustainable second generation biofuels that help the world overcome the global warming and energy crises. This new manner of obtaining green crude from microalgae could be part of a mix of sustainable second generation biofuels that help the world overcome the global warming and energy crises. CRIEPI representatives we spoke to were keen to stress that this technology will allow for biomass extraction that does not compete with food resources. This means green crude oil would not contribute to increased food prices, as have first generation bio-fuels produced from terrestrial crops like corn and sugar. However, production of fuel from algae does not necessarily reduce atmospheric CO2 since CO2 taken out of the atmosphere by the algae is returned when this biofuel is burned. At the very least however, it eliminates the introduction of new CO2 caused by burning depleting fossil fuels such as coal and oil. While we get the impression from the fair that technological advances are being made across the renewable energy sector, we observed a gap between the academic research results and the progress vis a vis corporations who intend to take this technology into the public domain. Even in the best-case scenarios, progress in this sector will take time. Developers commonly told us that they are aiming at commercializing their technologies by 2030. This is 10 years after Japan is meant to reach its 25 percent greenhouse gas emissions reduction target — a target for which, unfortunately, limited details have been provided. Nonetheless, overall these newly emerging technologies provide a glimpse into what our common renewable energy future may be. Kenji Watanabe is a former intern with United Nation University Media Studio in Tokyo. His research focuses on environmental law and intellectual property rights relating to energy technologies. He holds an LL.B. from Nihon University and LL.M. from The George Washington University Law School. solar power is better then wind! Thank you for your comment, Ruben.I also like the humble, static solar technology better than wind. However, in terms of cost efficiency, wind performs better than solar at present. Now many people expect that the law for purchasing home generated electricity at fixed rates will promote dissemination of solar technology. After the July election, however, the Japanese Diet (Congress) is divided again; LDP rules the upper house and DPJ dominates the lower house. And these two political parties have different CO2 reduction targets. The former aims at 8% and the latter at 25% by 2020. I am not yet sure what effect, if any, the difference would be but it is certain that renewable energy technology including solar, wind and biomass needs governmental assistance for further development and proliferation. Thank you. Thank you for this article. It got me thinking that why not combine both technologies. Here in Australia we have vast areas of land. They are still talking over the wind generation and solar alternatives. Why not have both in the same unit The panels between the wind generators seems as if this could be the perfect solution and have a better return on investment. If the wind generators could move into different directions this could capture more energy. Here would be the true efficient model solar and wind by day, wind only at all other times. I totally agree with you, what we explored on the fair in Yokohama that there will be merging between the new technologies and as mentioned in the article the main impression was to combine technologies and make them more sophisticated and optimize them. what is the Australian approach and widely used? Love it. Investing in clean, renewable energy sources is one of the keys to have a better future. It’s really sad that here in Chile yesterday Aug 24th, the Comision Regional del Medioambiente COREMA (Regional Enviroment Commision) voted against the enviroment. They allowed the construction of a Thermoelectric in Punta de Choros, a sanctuary of nature.